We would like to congratulate Moray Tawse, Joanne Tawse, Rene Van Ede, Paul Pender, and the team behind Redstone on being named Winery of the Year in the 2017 WineAlign National Wine Awards of Canada. This year’s national competition saw over 1700 from 272 wineries. In addition to being named Canada’s Winery of Year, Redstone wines were also awarded a total of 10 medals: 2 Platinum, 3 Gold, 2 Silver, and 3 Bronze. We are thrilled to have been the Architect and Interior Designer of Redstone and we know that this honour is the first, of many to come, for Redstone Winery and its team. PS. In a freshly published BBC Travel article on Toronto, Redstone was the only winery mentioned by name in how locals love exploring nearby wineries in Niagara. PPS. Back in 2016 we did a special edition newsletter behind the architecture of Redstone Winery, addressing everything from Dermot’s inspiration for the design to the local form and materiality used in the building. Above: A shot of the tasting room inside Tawse Winery. 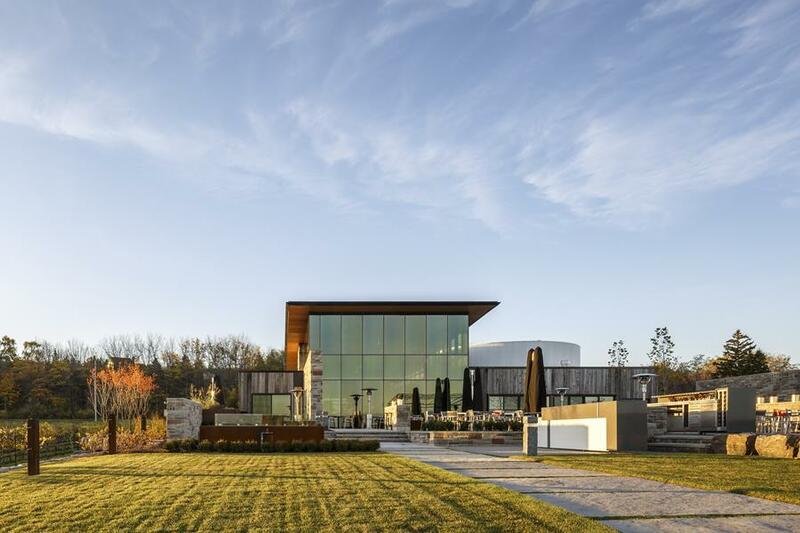 Moray Tawse’s original and eponymous winery, Tawse Winery, has won no less than four Canada’s Winery of the Year awards (for 2010, 2011, 2012 and 2016) and we recently completed a full re-design of their Retail and Tasting Room that greets every guest of the winery. Above: A shot of the elevated tasting room inside Tawse Winery. 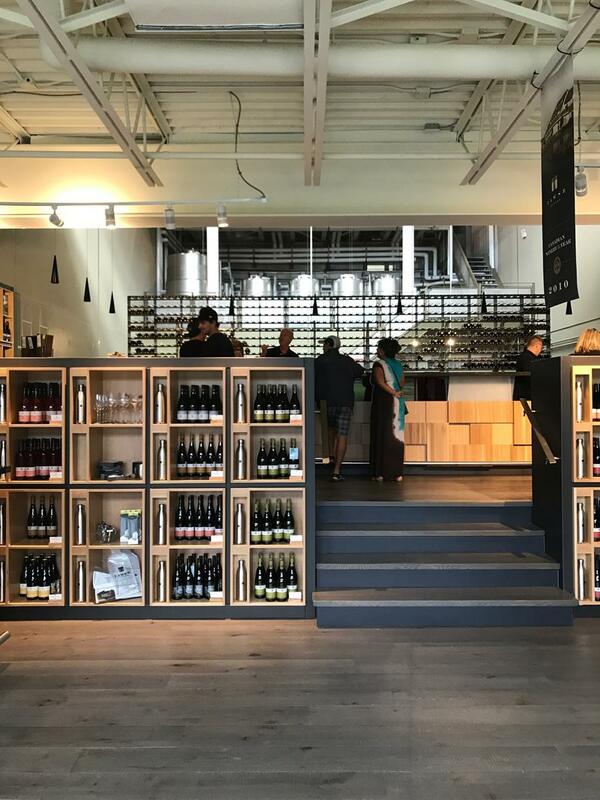 The new design is more spacious and accommodates for many different visitor activities, yet stores and displays more wine behind the bar than before. Bars and shelves are pulled towards the walls, leaving the centre of the room for visitor flow, event receptions and seasonal product display.. Large cabinet doors double as a chalkboard for staff to easily write highly visible customized messages. The counter and shelf designs take cues from the Tawse Winery logo. A compact retail point-of-sale station is conveniently located right next to the entry/exit for quick trips and transactions. For lingering wine tasters, an elevated area overlooks the retail space and features a long counter with a specially-designed wine rack as a backdrop. Made out of steel, the wine rack’s minimal design allows for intriguing views of the wine-making equipment behind the shelf. A small yet significant change to many guests’ first impression of one of the best wineries in Canada. 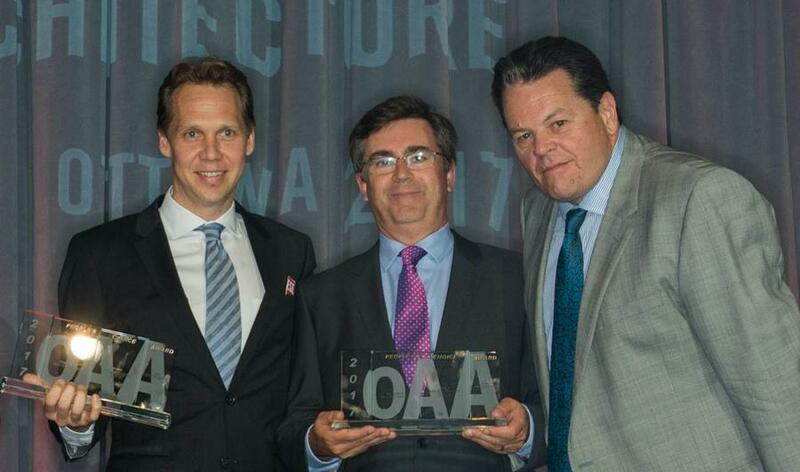 Above from left to right: Hugh Clark, Director of Development at Allied Properties, John Gillanders, Principal at Sweeny&Co, and Dermot Sweeny, Founder of Sweeny&Co, accepting the OAA People's Choice Award. Our team travelled to Ottawa to receive the Design Excellence Award for Queen Richmond Centre West (which we wrote about here), and was extremely pleased to hear that it had won the popular vote for the 2017 OAA People’s Choice Award as well. Announced to the public at the OAA Awards Gala, the People’s Choice Award is chosen amongst the Design Excellence Winners of the year (only ten projects from Ontario-based architects are selected annually) and is determined through an online public voting system. We thank everybody who participated and voted for Queen Richmond Centre West, we are incredibly proud of the fact that this project received top honours by professionals and the public alike. Above: Sweeny&Co Offices inside of Queen Richmond Centre West, Queen Richmond Centre West lobby, and exterior of Queen Richmond Centre West. An impressive and innovative example of heritage preservation, adaptive reuse and densification. The lobby is stunning, animating the street and offering the opportunity for a variety of community activities. The project hits all the sustainability buttons, both in terms of exemplary building performance and its contribution to the social, cultural and economic life of the neighbourhood. We thank the jury for the nomination and for their enlightening comments. We too believe that sustainable design in our cities is a multi-faceted and inherently human-oriented concept. The future of great cities will demand new solutions to complex problems, which ultimately will be measured against our quality of life. Our design philosophy is centred on the concept of Visionary City Building, and we will continue to stand by it as we move forward into the future.